Evelyn van de Veen always creates tailor-made programmes. All courses can be taught in English as well as in Dutch. She likes short workshops in which participants work on one concrete skill or product and leave with a tangible result. For example with an improved rubric. Or with a new and more activating start of their lecture. She uses analogies and playful activities to illustrate the essence of complex theoretical concepts. Talk "Practical problems with assignments and how to tackle them"
In this talk Evelyn discusses what tends to go wrong when lecturers design assignments for assessment. We will see how a systematic and integral design helps to avoid these problems and you will receive practical tips and ready-to-use templates for assignment design. How do you make sure that your assignment is suitable for what you want your students to learn and what you want to assess? 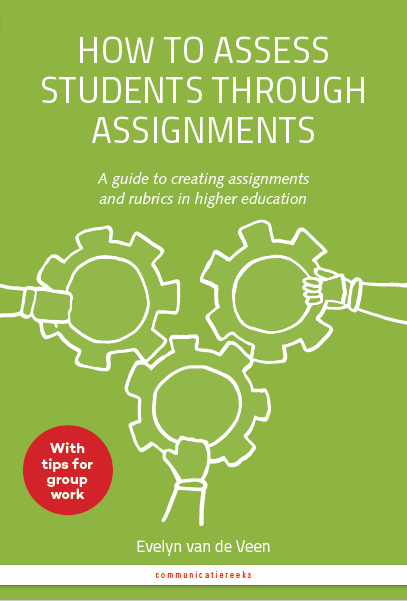 We start this workshop with some hands-on activities to discover the main aspects of assignments and how these work together to determine what is being assessed. We discuss common problems and how you can design an assignment systematically so that it is suitable for what you want to achieve. You will use an assignment specification form to analyse the consistency of one of your own assignments and to make improvements where needed. We can also discuss the specific requirements for designing group work assignments. There tends to be a lot of tinkering with rubrics. First they are too vague, then they become too detailed. Or teachers feel restricted by them. This workshop kicks off with assessing a simple action using different types of assessment sheets. We will compare these and discuss how they work in practice. You will receive concrete guidelines for making rubrics that are easy to use and that match the purpose of the assignment. Using these guidelines, you will design or improve your own assessment sheets. If students mainly study "for the exam" do they learn what you want them to learn? And can you trust the result of the exam? In other words, does the exam distinguish correctly between the students who deserve to pass and those who deserve to fail? When the questions are not formulated precisely enough, or when they do not cover a representative sample of the subject material, the exam result may be influenced by chance more than by student skill. As a result, students who know the subject well may fail, or students who don't may pass. This may happen if questions are so open that the answer can go in many different directions, making it very hard to distinguish between "right" and "wrong". Or with multiple choice questions whose wording inadvertently gives the right answer away. In this course, participants learn to formulate exam questions that match the learning objectives. And they learn techniques for analysing the quality of exams as a measuring instrument. By applying some very practical guidelines, lecturers can make sure that their exams test what they want to test, and that questions have been formulated in such a way that marking becomes easier - and quicker. According to Dutch law, exam boards need to monitor the quality of exams. To do this effectively, committee and board members need expertise on assessment and how to recognise and diagnose problems. In this course, participants learn the formal requirements for summative tests and practice spotting problems in tests, even in fields that are not their own. For example, how do you assess the level of the questions? And how can you determine whether an exam matches the assessment matrix? You will also learn how to interpret the results of a statistical test analysis and what its limitations are. You know why the topic you want to teach is important. But does your audience? How do you convince them of the relevance of a theory? Or show them the usefulness of a new technique that they have always managed without? One way is to tell them a well-chosen anecdote that illustrates the importance of the subject. In this one-hour workshop you will learn how to choose an anecdote and how to structure it for maximum effectiveness. The lecturer speaks, the students listen. It can be hard to change this pattern. If you ask a question you may face an uneasy silence or perhaps it is always the same student who answers. In this one-hour workshop you learn two important techniques for getting students to speak up: how to formulate a stimulating impulse for a discussion and how to create space for students to react to each other. How can you design your teaching in such a way that people are able to apply new knowledge in practice, and are also motivated to do so? How can you make sure they see the relevance of what they are learning and connect it to their own experience? How do you develop activities that have a clear focus and relevant outcomes? These are the central themes in teaching skills courses by evandeveen. There is also a lot of opportunity to practice skills such as facilitating discussions, explaining, or dealing with unwanted student behaviour.